Welcome to Chumming with Sharky™, my blog series where I treat viewers from every corner of the deep blue sea with a taste of talented authors from a myriad of genres. This month, it is my pleasure to welcome fellow horror author Dr. Erik Gustafson to chat it up talk show style. Grab some hors d’oeuvres, take a seat, and enjoy the show . . .
Anchor: Okay, Sharky, I’ve got all three members of our studio audience seated and served. How about you and Mr. Gustafson let me know what drinks I should whip up for you today. And no Blood in the Water for you, Sharky. Sharky: Fine, no vodka. Maybe some whiskey? Anchor: Yeah, I guess you can handle that. Jacob’s Ghost then? Anchor: What about you, Mr. Gustafson? Jacob’s Ghost? Liquefied Ghost? Or how about my specialty? Erik: I am a rum guy, myself! A rum and Coke would be wonderful right now. Anchor: An excellent choice, Mr. Gustafson. Rum and Coke it is. Sharky: While Anchor makes our drinks, let’s talk a little bit about the horror genre. So, Erik, what it is about horror that interests you most about the genre? Erik: I guess the thing that attracts me most about horror is the scare factor. I like the idea of getting deep into someone’s subconscious and giving them a little chill. And making them think. Sharky: Yes, there is nothing like a good bone-chilling scare to mess with a reader’s or viewer’s psyche. I actually quite enjoy receiving that in measured doses. The first horror movie I can think of that gave me a good scare was Friday the 13th (1980). Why my parents let me watch that movie as a kid I have no idea. Punishment? Their own sick entertainment? I’m still in therapy 30 years later. That final scene where Jason jumps out of the water scared the poop out of me. As far as novels go, Stephen King gave me my first horror experience with Pet Semetary. That book creeped me out. So, what about you, Erik? Can you remember the first scary movie and/or novel that really stands out for you? Erik: Friday the 13th is a classic, but the one that stands out for me as a book and a movie actually, was Pet Semetery too. Something about the possessed little kid, Gage, I think was his name and that Indian burial ground. Scared the hell out of me and haunted my thoughts. Salem’s Lot was another book that stuck with me. Anchor: Sorry to interrupt, but here are your drinks, gentlemen. I also boiled up some ghost shrimp for you guys. You know, because . . . oh, never mind. I’ll head back to the bar. Sharky: Um . 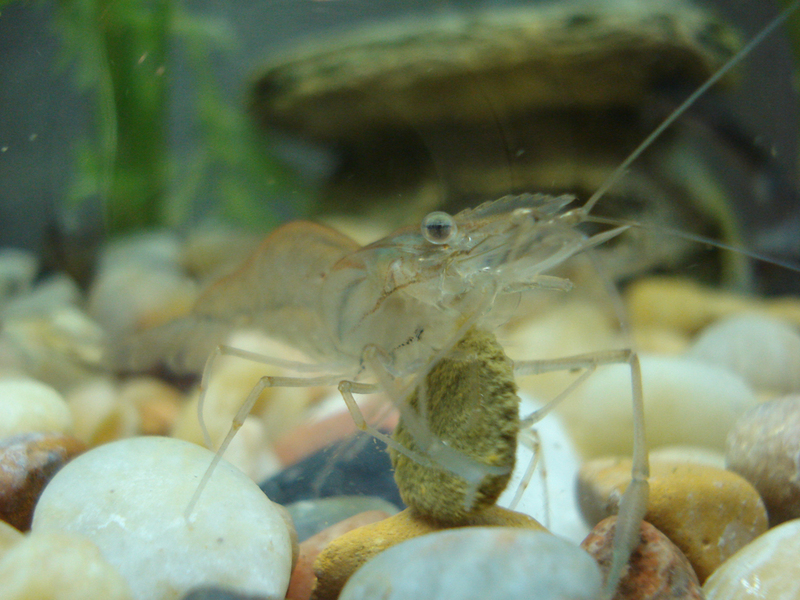 . . I’m not sure what happened to the prawns I bought, but okay, I guess these tiny ghost shrimp will have to do. Anyway, speaking of ghosts, my team of informants discovered that our featured guest has a particular interest in ghost hunting. Care to share a little bit about that, Erik? Erik: Well I am a ghost-hunting TV show junkie and a couple years back my wife got me some gear for Christmas. I have an EMF meter and an EVP device. I have had several investigations, but have never uncovered any evidence as of yet. Who knows what that means, but I am pretty confident my house isn’t haunted. We have an unfinishedbasement with a couple of creepy rooms I thought for sure would have ghost lurking about. My cats seemed convinced they are haunted, I’m sure of that! Sharky: I sometimes wonder about my house when my dogs stare at nothing in particular and then kind of grumble. Oh, and for our non-ghost hunting readers could you explain briefly what an EMF meter and EVP device are? (Side note: If you have a photo of these devices, feel free to share. Otherwise, I’ll use the image above). Erik: Tools of the trade, I guess. EMF is something that detects change in the electromagnetic field I think and EVP is just a recording device that picks up voices that are outside of our range of hearing. Sharky: Cool. Thanks for clearing that up for us. Have you ever experienced a strange occurrence that you could only describe as possibly something as a supernatural phenomenon? Erik: I swear my cats have and see ghosts on a regular basis, but unfortunately I never have. I keep hoping someday I will. Sharky: We don’t have time to discuss it now, but sometime I’ll have to tell you about one encounter that I experienced, which involved a Ouija board. It happened when I was a kid. Anyway, this isn’t about me. We’re here to talk about you. Last year I read your book Fall Leaves and the Black Dragon, which I enjoyed very much. I’d like to share your book trailer and then we’ll talk a little bit about your writing. Dim the lights, please. Sharky: Like I said, I enjoyed reading Fall Leaves and the Black Dragon. It was fast-paced and kept me turning the pages. 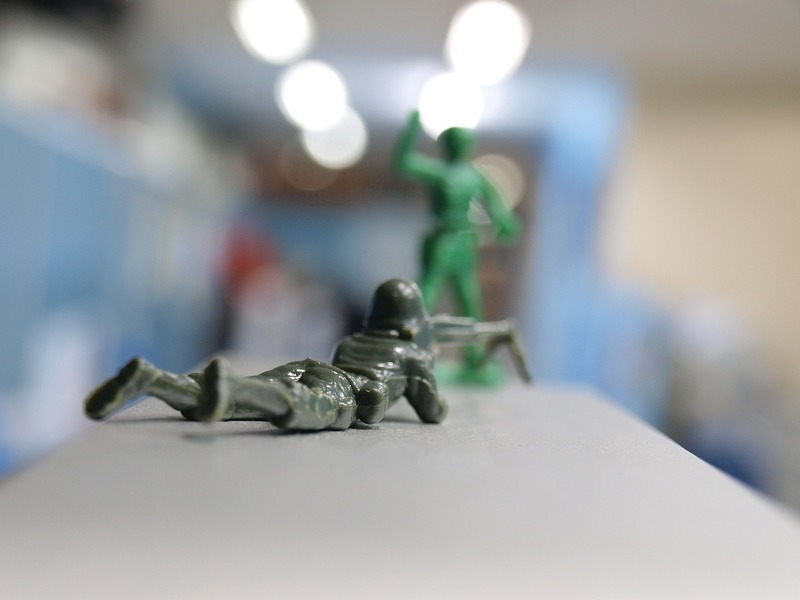 But plastic Army men officially creep me out now. Sharky: Tell us a little bit about your inspiration for writing this novel. Erik: Most of the inspiration for this one came from childhood memories. I had a friend who was playing with matches in his backyard and somehow he set himself on fire. Not sure what happened to him, but that always stuck with me. Sharky: Ah, and a direct reference to Fall Leaves and the Black Dragon, a story I thoroughly enjoyed reading. Speaking of which, you have a number of other stories in the horror genre (which readers can check out below). Which one is your favorite? Erik: My favorite one is my latest novel The Carousel in the Sky. It is a dark fantasy that came to me in a dream one night. I dreamt of a mansion out in the woods with a working carousel revolving around its roof. Sharky: Interesting. I’ll have to check that one out. Are you working on any new projects? Erik: Nope. I quit writing. I told myself when I started I would stick out for three novels and see how it went. Third novel’s a charm or three strikes and I’m out was my mantra. Didn’t work out. Sharky: That’s not quite the answer I was expecting, but I can certainly understand. In any case, you have some stories out there to share with the world. It’s the experience of the journey that counts. And today’s journey in the shark tank is coming to close, but before we go, I’d like to tickle that creative mind of yours a bit. I like to end each episode of Chumming with Sharky™ with a hypothetical scenario for my guest to ponder. Here’s yours, Erik . . .
You move your family into an old house built in the early 1900s. It’s been abandoned for years and needs a lot of renovations, but you got it a great price. Plus, you’ve heard stories that the house may be haunted with ghosts. The locals warn you to reconsider moving, but your curiosity of the supernatural far outweighs any fear of ghosts. After all, you’ve been waiting a lifetime to finally see one. Several months go by, you complete your renovations, and aside from finding an old projector with a collection of silent home movies, there is nothing else to get your heart beating faster . . . until you watch one particular film with no label. In the movie you witness a brutal murder that occurs in the living room of the home you purchased. After chopping up his victims, the killer turns to face the camera and smiles. Then the screen goes black. That night you wake up to screaming coming from downstairs. You check on your family to make sure everyone is safe and then head downstairs to investigate. Tell us what happens next. Sharky: That’s just awesomely creepy! Thanks for sharing and taking the time to hang out in the shark tank. Erik: Thanks for allowing me to chum along with you. It’s been great! Sharky: And to you, my loyal fans (okay, all three of you), be sure to stalk Erik and check out his books below. Maybe we can convince him to pen another story in the future. Until next time, keep the waters bloody and come back for another chummy episode. I spent 20 years serving in the United States Air Force, and have had the fortune to live all over the world, including Iceland, Germany, and in a tent for a year in Saudi Arabia. Always an artist at heart, I produced many paintings during my adventures. After my service, I settled down with my family (wife, two great daughters, 2 cats and a little white fluff dog) in small town Iowa, where I love to volunteer at the antique carousel. Now, I help people with intellectual disabilities to reach their potential and teach psychology classes at a local college. I switched from a paint brush to a pen and am now a horror writer, by night. I am working on my forth novel. I have been published in The Horror Zine, Horrified Press, Sirens Call Publications, Pleasant Storm Entertainment, Crypto and Co., Death Throes Webzine, and several other horror anthologies. Escape from your reality for a bit and get scared. It feels good. Find me all over the Internet. Connect with me on Twitter or on Facebook. Chumming with Sharky™ is a spotlight series brought to you by Robert “Sharky” Pruneda, author of Victory Lane: The Chronicles and Devil’s Nightmare. If you would like to be a guest on Chumming with Sharky™, or you know someone who you think would like a featured post, please contact me via EMAIL, Twitter @SharkbaitWrites or on Facebook. Well done Erik and Sharky. Always entertaining! Thanks, Eden. Stay tuned, because I’ve got some awesome folks in queue for this year. Ooh! Sounds scary. And as always, A great interview. Thanks, Karen. Fall Leaves and the Black Dragon was a fun read. Great interviews. Both you guys are scary.